The range of this subspecies of Elgaria coerulea, barely extends into Califoria. Del Norte County is even considered an intergrade zone between two subspecies by some researchers. It is typical in intergrade zones to find animals that show characteristics of either subspecies. 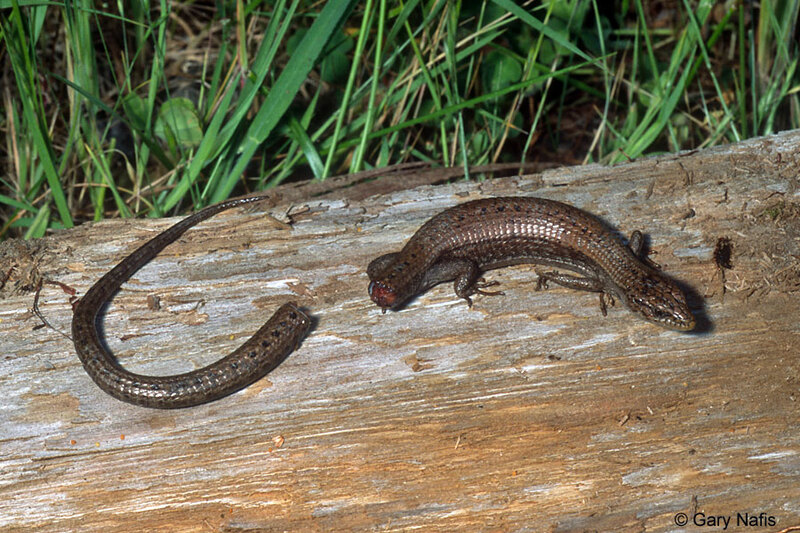 The lizards above were all found at the same location north of Crescent City, but the lizard on the left shows the appearance and scale count of E. c. principis, while the others are more similar in appearance to E. c. shastensis, the Shasta Alligator Lizard. and looks like it might be a mix of it - E. c. shastensis and E. c. principis. © Alan Barron Note the slightly forked tongue on this video capture of an adult lizard from Thurston County, Washington Western Alligator Lizards, genus Elgaria, have large rectangular keeled scales on the back that are reinforced with bone. It is common to find blood-engorged ticks attached to alligator lizards, especially in and around the ear openings, as you can see on the Shasta Alligator Lizard on the left and on the San Francisco Alligator Lizard on the right. 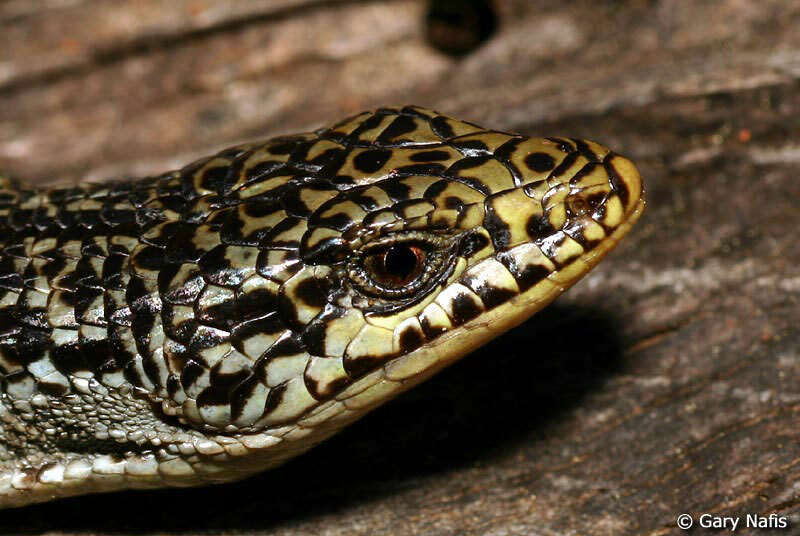 As a defensive measure, an alligator lizard may drop its tail, leaving it writhing on the ground. The writhing tail is intended to distract a predator. The loss of the tail does not harm the lizard. It will grow back. A gravid adult female Northwestern Alligator Lizard found in a grassy spot in Thurston County, Washington. This video shows how an alligator lizard's tail thrashes around after it has been dropped to distract a predator. The tail moved for about 4-5 minutes, which has been cut down here to about a minute, showing several different speeds until it is just barely moving. They are characterized by a slim body with short limbs and long tail. The dorsal scales are more weakly keeled than on other E. coerulea subspecies. The temporals are weakly keeled. The eyes are dark around the pupils. The head is usually not heavily mottled with dark color. Color is brown, grey, olive, or brown, above, with a broad band of olive-gray to brown down the middle of the back, sometimes with spots, and with darker sides mottled with dark spots. Typically there are no black scales wiith white tips on the sides. Markings do not form distinct bands or vertical bars. Newborn lizards are very thin and small, roughly 4 inches long, with smooth shiny skin with a plain tan, light brown, or copper colored back and tail. The sides are darker and sometimes mottled or barred as they are on adults. Juveniles gradually develop the large scales and heavy dark barring found on the back and tails of adults. Active during the day. Inactive during cold periods in winter. Alligator lizards are generally secretive, tending to hide in brush or under rocks, although they are often seen foraging out in the open or on roads in the morning and evening. May occur in concentrated colonies. A lizard may detach its tail deliberately as a defensive tactic. When first detached, the tail will writhe around for several minutes, long enough to distract a hungry predator away from the lizard. Samuel M. McGinnis (Stebbins & McGinnis, 2012) reports seeing a juvenile southern alligator lizard bite onto its own tail making itself impossible to be swallowed by a juvenile Alameda Striped Racer, which eventually gave up. After mating, the female carries her young inside her until they are born live and fully-formed sometime between June and September. During the spring breeding season, a male lizard grabs on to the head of a female with his mouth until she is ready to let him mate with her. They can remain attached this way for many hours, almost oblivious to their surroundings. Besides keeping her from running off to mate with another male, this probably shows her how strong and suitable a mate he is. Woodland, forests, grassland. 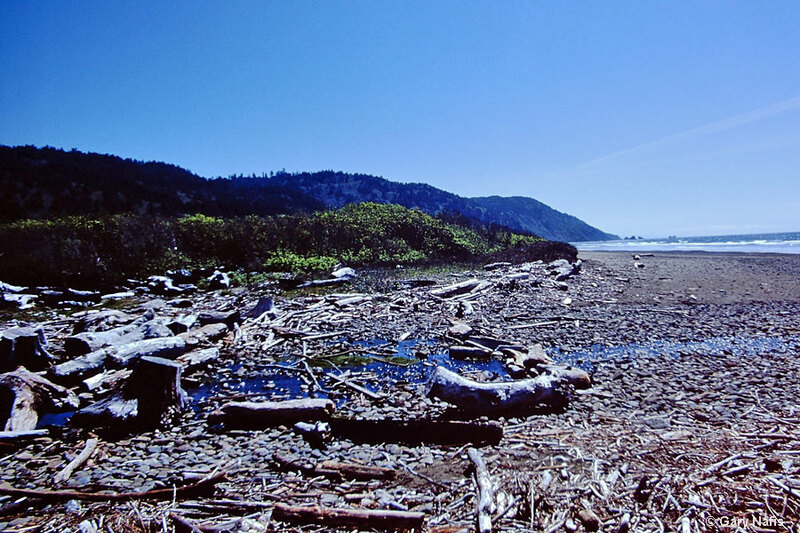 Commonly found hiding under rocks, logs, bark, boards, trash, or other surface cover. Prefers wetter and cooler habitats than E. multicarinata, but generally found near sunny clearings. In California, the subspecies Elgaria coerulea principis is only found in the extreme northwest in Del Norte and Siskiyou counties, and possibly northern Humboldt County. (Stebbins, 2003, shows this to be an intergrade zone.) Outside of California, the range extends north to British Columbia, including Vancouver Island, and east through northern Washington to extreme northwest Montana. The species Elgaria coerulea ranges from Southern British Columbia south chiefly west of the Cascades and Coast Ranges to northern Monterey County, east into northern Idaho and northwestern Montana, with isolated populations occurring in southeastern Oregon, northwestern Nevada and the Warner Mountains in California, and south through the Sierra Nevada Mountains to Kern County. Stebbins (2003) shows the elevational range of the species Elgaria coerulea as sea level to around 10,500 ft. (3,200 m.) but only the subspecies E. c. palmeri can be found that high up. The other subspecies range much lower. "Our phylogeographic examination of E. coerulea uncovered surprising diversity and structure, recovering 10 major lineages, each with substantial geographic substructure." "The taxon appears to have a Sierra Nevada origin and then moved both north and west to occupy its current distribution (as postulated 60 years ago), diversifying into a number of geographically confined clades along the way. The patterns of range limits and clade boundaries shared between E. coerulea and other codistributed forest and woodland species provides compelling evidence that a handful of major biogeographic barriers and historical events (e.g., San Francisco Bay and Monterey Bay outlets, Sierra Nevada glaciation) have been instrumental in shaping phylogeographic patterns and have likely influenced species range limits and even patterns of community assembly in the California Floristic Province." * Brian R. Lavin, Guinivere O.U. Wogan, Jimmy A. McGuire, and Chris R. Feldman. Phylogeography of the Northern Alligator Lizard (Squamata, Anguidae): Hidden diversity in a western endemic. © 2018 Royal Swedish Academy of Sciences.